The island of Fårö is located north of the island of Gotland in the Baltic Sea. For some tourist information, start here! For travel by sea, contact your travel agent soonest possible as August is peak time for the ferries between the Swedish mainland ports of Nynäshamn/Oskarshamn/Västervik(new) and Visby. For train reservations, see www.sj.se/en/home.html#/ (Swedish mainland only. There is no train service on Gotland). - HF 19 bus shuttle from Visby ferry port and airport on Sunday - as announced down below! - HF 19 bus shuttle to Visby Airport on Wednesday (evening flight) may be arranged for participants to the BLOS/HFIA meetings in Stockholm on Thursday/Friday. Rental cars may be picked up at the airport as well as at the ferry port. Drive road 148 to Fårösund, then take the free road ferry to Fårö, check Timetable, see YouTube videos. Continue the road north 8 km and follow the signs. 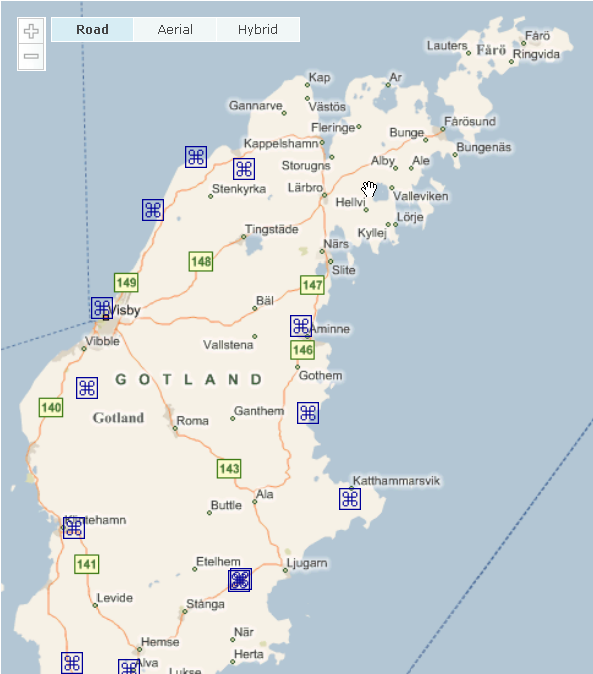 The Fårö Kursgård Camp, is located close by the Fårö Church (centered on map, zoom in). From ARN Arlanda (Stockholm) to VBY Visby (Gotland), direct flight (45 minutes): 09:30, 11:35, 14:05, 16:40, 21:40. From BMA Bromma (Stockholm) to VBY Visby (Gotland), direct flight (40 minutes): 12:30, 14:40, 15:30, 16:40, 17:25. There is a special bus connection from Stockholm Central departing central station approx 2 hours before the ferry departure. From Västervik to Visby (about 2,5 hours): 08:00. Bus shuttles to HF 19 from Visby. These will be able to match the air and sea departures listed in bold blue above. Waiting time in Visby may be used to stroll around the old town (and this Sunday is the last day of the Medieval week on Gotland). The first bus will depart at around 16:30 from Visby harbour terminal, via VBY airport departure at around 17:00. ETA to HF 16 at around 18:30. The second bus will depart Visby harbour at around 18:30, via VBY airport departure at around 19:00. ETA to HF 16 at around 20:30. NOTE: If the 17:00/19:00 bus departures from VBY airport are not suitable for you we can assist to arrange shared taxi transportation at a reasonable price. This would leave the airport some time (to be informed to those in need) later than 19:00. Please include this information by e-mail or as a comment in your conference registration. arriving Visby airport at around 15:00, and arriving Visby harbour at around 15:30. You will be able to catch some of the air and sea departures listed in bold blue below. Waiting time in Visby may be used to stroll around the old town before departure. Else, you may have to leave the HF 19 camp earlier (use other transport). From VBY Visby to ARN Arlanda, direct flight (50 minutes): 06:40, 09:30, 12:45, 14:55 16:00, 19:10. From VBY Visby to BMA Bromma, direct flight (40 minutes): 06:35, 07:20, 08:50, 09:45, 12:40, 14:55, 16:35, 17:30, 19:30. If you stay an extra night after the conference, this day there is no bus shuttle planned for return to Visby. For public bus, see separate page. From VBY Visby to ARN Arlanda, direct flight (45 minutes): 06:40, 12:45, 16:00. From VBY Visby to BMA Bromma, direct flight (40 minutes): 06:35, 07:20, 08:50, 12:40, 14:55, 16:10, 17:30, 18:45, 19:50.